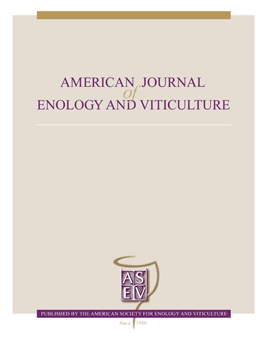 The American Journal of Enology and Viticulture (AJEV), published quarterly, is the official journal of the American Society for Enology and Viticulture (ASEV) and is the premier journal in the English language dedicated to scientific research on winemaking and grapegrowing. AJEV publishes full-length research papers, literature reviews, research notes, and technical briefs on various aspects of enology and viticulture, including wine chemistry, sensory science, process engineering, wine quality assessments, microbiology, methods development, plant pathogenesis, diseases and pests of grape, rootstock and clonal evaluation, effect of field practices, and grape genetics and breeding. All papers are peer reviewed, and authorship of papers is not limited to members of ASEV. The science editor and a group of associate editors, who are drawn from academic and research institutions worldwide, guide the content of the Journal.